Navigating the nitty-gritty details of Canadian investment tax rules is not always an easy task. Here are some helpful websites to steer you in the right direction. 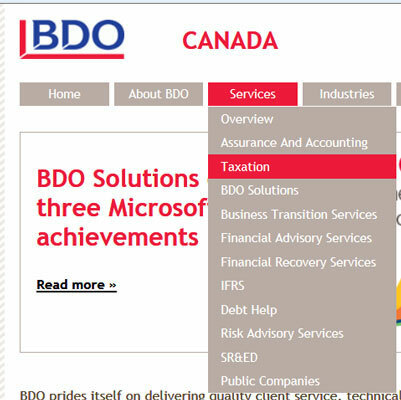 BDO Canada: The library section of this site is chock full of tax information ranging from tax facts and figures for each province to tax tips on a variety of tax and estate planning subjects. Deloitte: Keep your eye open for tax alerts for up-to-date tax changes. You’ll also find a handy automobile logbook to help you keep track of business kilometres for auto expense claims. KPMG: Find out all the latest tax changes by visiting this site and reading “Tax Facts”. PricewaterhouseCoopers: Visit the publications area of the site for PWC’s tax newsletter “Tax Memo” and tax guides on specific subjects. Their annual “Tax Facts and Figure” is a must read. The Canada Revenue Agency website is an excellent source for information. Here, you can download a copy of the income tax package and request additional forms. The site also contains detailed information on the most frequently requested topics. If your question relates to your tax situation or you need general help, try the CRA’s automated TIPS line (Tax Information Phone Service). Call 1-800-267-6999. To obtain specific information on your tax account, you need to provide your social insurance number, your month and year of birth, and the total income reported on line 150 of your last assessed return. Child Tax Benefit: Find out whether you’re eligible to receive the benefit and when you can expect to receive a payment. Goods and Services Tax/Harmonized Sales Tax (GST/HST) credit: See whether you’re eligible to receive the credit and when you can expect to receive a payment. RRSP deduction limit: Want to know your RRSP deduction contribution limit for the year? TIPS has your answer. Tax refund: Find out the status of your refund. TFSA contribution limit: TIPS will tell you your current contribution limit as well as some general information about using the TFSA. Bulletin Board: Recent tax and benefit information. Business Information: Tax and GST information for those who operate a business or are thinking of starting one up (for example, how to handle payroll tax, CPP, and EI deductions). Info-Tax: General tax information on a number of tax topics. The CRA offers a service through its website called My Account, where you can access information about your personal tax and benefits 7 days a week, 21 hours a day. Sure beats trying to phone in the middle of tax season, when all you get is a busy signal! You can also use My Account to change your filed return, to change your address and/or phone number, and to dispute your Notice of Assessment. To access My Account, you need to register for a Government of Canada epass. You can do this by going into My Account on the CRA website. After you’ve completed the registration process and chosen your password, CRA mails an activation code to you. Just key in the CRA activation code and your password to get full access to My Account for the first time. After that, you’ll just need to enter your password. When you don’t have an epass but need immediate access to some of your tax information, you can go into the Quick Access section of My Account. Quick Access will tell you the status of your tax return and benefit payments, your RRSP deduction limit and your TFSA contribution room. To identify yourself, have your social insurance number, date of birth, and total income from line 150 of your last processed tax return handy. Agents are also available to answer your questions by phone, Monday to Friday (except holidays), 8:15 a.m. to 5:00 p.m. To accommodate the flood of calls during tax season, these hours are extended until 10:00 p.m. weekdays, and include weekends from 9:00 a.m. to 1:00 p.m. from mid-February to April 30 (excluding Easter). Contact the CRA by phone at 1-800-959-8281. If your query is in regard to electronic services (NETFILE or My Account), call the e-service Helpdesk at 1-800-714-7257. If you would like someone else to call the CRA on your behalf, be sure you’ve completed and mailed consent form T1013, “Authorizing or Cancelling a Representative.” This form gives the CRA permission to discuss your tax affairs with someone other than you. If you can’t find the information you need on the website, through TIPS, or through My Account, try contacting your local Tax Services Office (TSO). (Note, though, that they really prefer you to call the toll-free number!) The TSOs are open Monday to Friday (except holidays, of course), 8:15 a.m. to 4:30 p.m. (sometimes 5:00 p.m.). To find the location of your nearest TSO, visit the CRA’s website and click “Contact us” from the main menu. Service is by appointment only.